You can use CodeSignal and Greenhouse together to seamlessly manage your candidates, keeping Greenhouse data in sync with CodeSignal data and vice versa. To implement this integration, you need to authorize CodeSignal to use your Greenhouse account. The Greenhouse integration with CodeSignal only needs to be completed by ONE user from your company. You must have a CodeSignal user type of Admin. You must be logged in to your Greenhouse account. 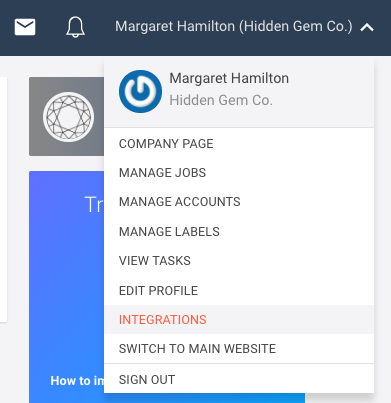 Choose Integrations from your account dropdown in the upper right corner of your dashboard. 2. Click Integrate next to the option for Greenhouse. This opens the Greenhouse Integration modal. 3. Click the API Configuration Page link to access the API Credentials page on Greenhouse. 4. On the Greenhouse API Credentials page, click the Create New API Key button. 5. Add a descriptive name like “CodeSignal” in the Description field, and select Harvest from the Type drop-down menu. Click Create. 6. On the Manage API Key Permissions page, select the following permissions. Then click Update. 7. Scroll down the list to find your newly created API key. Click Copy to copy it to your clipboard. 8. Go back to the CodeSignal tab and paste your new API key into the Harvest API Key field of the Greenhouse Integration modal. 9. 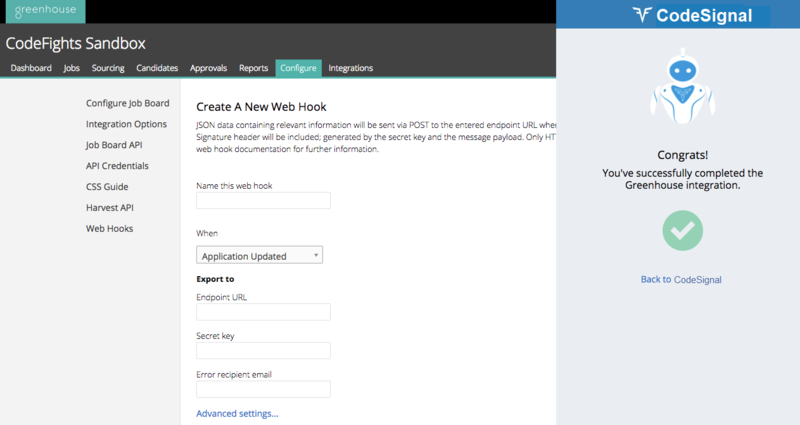 Once the Greenhouse Harvest API Key is pasted into the dialog box, navigate to the Webhooks section. Download the CodeSignal Chrome Extension, then click the Webhooks page link. 10. The CodeSignal Chrome Extension will pop up on the right side of the page. Click Create All. 11. Once you see the success message, click Back to CodeSignal. 12. Click Copy to copy the pre-populated CodeSignal Assessment API Key to your clipboard. Note: You need to give this key to your Greenhouse account manager. Start by emailing [email protected] to open a ticket. The Greenhouse support team will send you a SendSafely link so that you can send the API key in an encrypted format. Once the Greenhouse support team has uploaded this key to your Greenhouse account, CodeSignal Test will be one of the available options when you're creating an interview plan in Greenhouse. 13. Click Next. The modal will advance to the next slide, User Account Mapping. 14. For each CodeSignal user in your company, select the corresponding Greenhouse user. All CodeSignal users must be mapped in order to be able to use the Greenhouse integration. 15. Click Done. Set up in CodeSignal is now complete! 16. In Greenhouse, you will now be able to add the CodeSignal Test stage to the interview plans of your choice. Select a job and click on "Job Setup." Scroll down to Interview Plan and click "Edit." Click "Add Stage" and select CodeSignal Test. Click "Add" to incorporate sending a CodeSignal Test to your interview plan. Congratulations! You have successfully integrated your Greenhouse account and your CodeSignal account.